Thanks to Jean Quentmeyer, a genealogist with a Ph.D. in Clinical Psychology, the information is in good order for the descendants of Christian’s grandson Michael HUFFORD. My information on Hufford descendants has been improved by many people whom I’ve never met face-to-face, people who have found my work and been willing to add to it. Jean is one such person. She descends from a set of ancestors of Michael Hufford’s wife, and she happened upon the Huffords while tracking the descendants of those ancestors. Michael Hufford was a farmer. He was born in the Shenandoah Valley, in Rockingham County, Virginia, in 1804, the 11th of the thirteen children of Casper HUFFORD and Catherine STIHLI. When Michael was just a little boy, his father moved the family to Fairfield County, Ohio, and that’s where Michael and Anna Marie LOWMASTER married in 1826. After they married, they moved to Crawford Co., Ohio. By 1860, they were in Seneca Co., Ohio. Sometime before he died in 1875, Michael and Anna Marie moved to Kent Co., Michigan. He died when he was 70; she lived another four years. They had ten children. 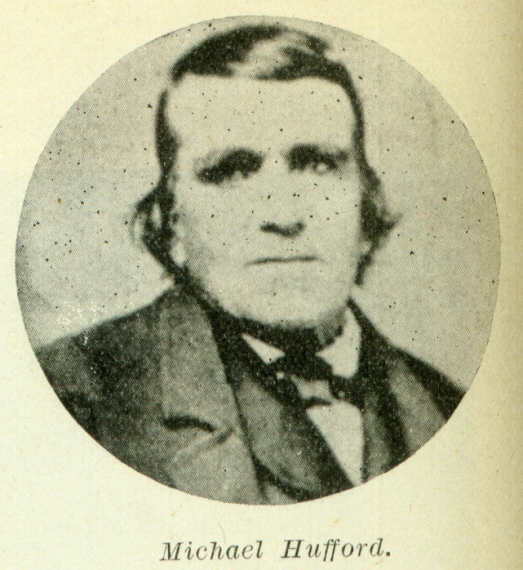 In the 1909 Hufford Family History, Michael and his descendants are on pages 172, 173, 174, 175, 176, and 177. The list below (on page 2) has every person on those six pages, and the list follows the descendants as far as I could (living people omitted). Links are to findagrave.com pages where there is additional information about the person. PAGE NOTE: Michael Hufford, Sr., is on page 172 of the 1909 HUFFORD FAMILY HISTORY.